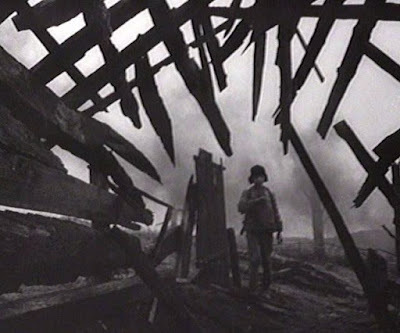 Ivan’s Childhood (in the US aka, My Name is Ivan, 1962) was the debut feature film of legendary Russian auteur Andrei Tarkovsky; and even in this first work, one can see many of the provocative and moody stylistic flourishes that would characterize his entire oeuvre. The titular protagonist, Ivan Bondarev (played Kolya Burlyayev, who would also have a prominent role in Tarkovsky’s next film, Andrei Rublev (1966)), is a broken child, not a hero. He seeks only revenge. But we can still sympathize with the agony of loss that he has suffered. Lieutenant Galtsev (Evgeniy Zharikov) is conscientious, serious, and principled. He is an introverted perceiver who reflects before he acts. Captain Kholin (Valentin Zubkov) is prideful, passionate, and impulsive. He is an action-taking extravert, but his actions, though genuine, can lead to trouble. He wanted to evoke feelings by means of his expressionistic mise-en-scene, about which I have commented further in my review of Andrei Rublev (1966) . This included evocative shots of rain-soaked landscapes and wandering wildlife that establishes a mood of grim fatefulness. There are also expressionistic dream sequences whose focalizations are unclear. Are these supposed to be dreams of Ivan, as they initially seem to be. 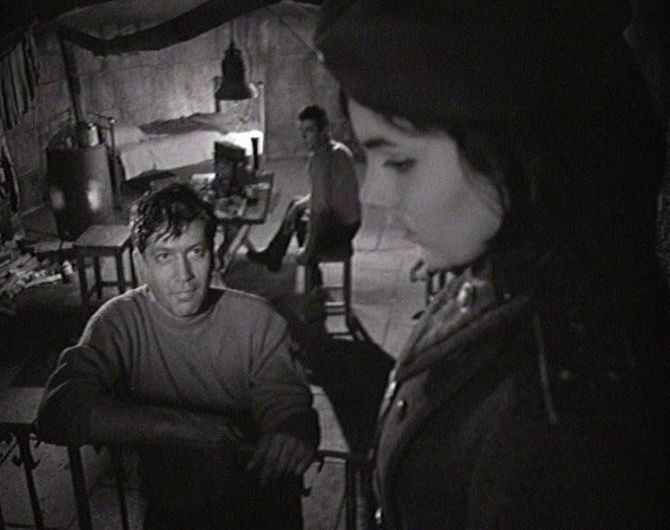 Or are they, instead, displaced dreams of Galtsev, Tarkovsky, or (most probably) the viewer? The film opens with imagery that turn out to be the first of the film’s four explicit dream sequences (besides those four dreams, the film also includes allusions to some other “dreamy” experiences). 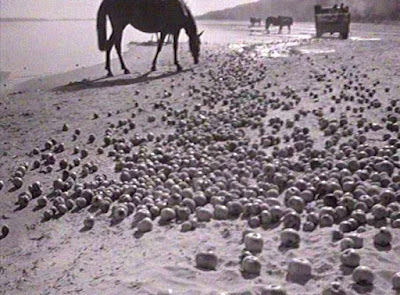 In Dream #1 Ivan is remembering idyllic moments wandering about in nature with his mother (Irina Raush Tarkovskaya, Tarkovsky’s wife at the time). But the boy awakens from the dream and finds himself in an abandoned mill. 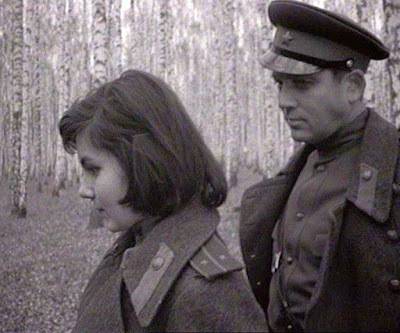 He then stealthily makes his way across a swampy river to the Russian side of the war front and reaches a military station commanded by Lieutenant Galtsev, who is unaware that the boy is actually a spy for the Russian army. Despite his youth, Ivan arrogantly demands to be put in touch with “#51" , who we soon learn is Lieutenant Colonel Gryaznov (Nikolay Grinko). 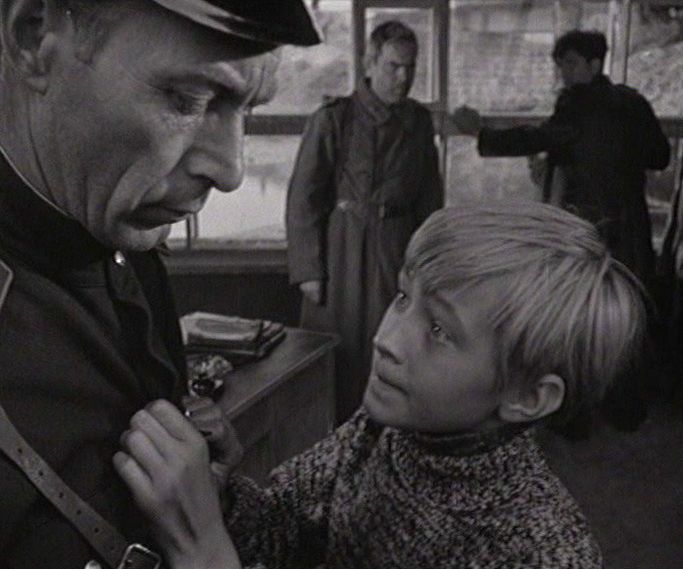 The colonel confirms the boy's importance and is shown to have a fatherly feeling for Ivan. But despite the boy’s value as a spy, the colonel wants to send him to the safety of a military school away from the front. Another fatherly friend of Ivan then appears, Captain Kholin, who works with the colonel. In this section, Ivan has another expressionistic dream sequence, Dream #2, this time more horrific, showing him and his mother looking down into a well, just prior to the death of his mother. The next section seems to be somewhat of a diversion, but it offers more of a picture of Galtsev and Kholin. Masha is a beautiful young medic who operates an infirmary along the front line, and she draws the interest of both the romantically aggressive Kholin and the more reserved Galtsev. Just as the Colonel and Kholin want to send Ivan away from the front, Galtsev wants to send Masha away, too. For him, war is no place for women. But Kholin hopes she will stay around. 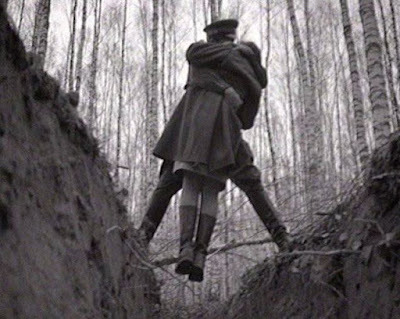 This sequence includes a memorable scene showing Kholin and Masha wandering about in a picturesque beech forest, including a striking two-minute shot of the two approaching each other and a 55-second shot showing Kholin suddenly embracing the girl as she crosses over a ditch. Later Masha is shown via expressionistic imagery to be wandering alone dreamily among the beech trees. Now the focalization shifts from Galtsev and Kholin back to Ivan. 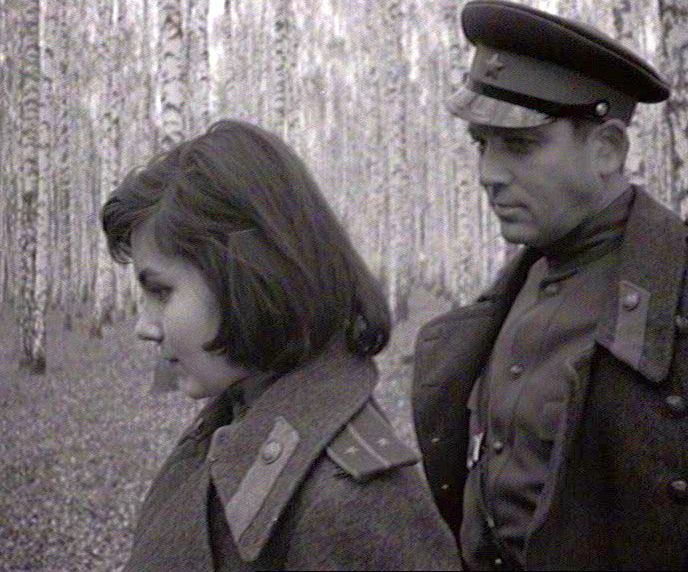 Although the Colonel and Kholin try to send Ivan back to safety, the boy stubbornly escapes his escorts and returns to the front in order to continue his fight. So they prepare for one more mission. Ivan is resolute and has a fantasy in his bedroom of him using his knife on imaginary German culprits. 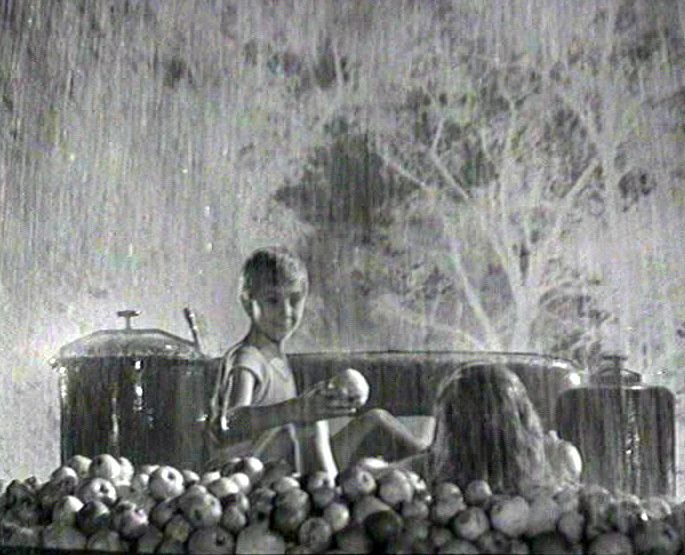 Later in his bed, he has another expressionistic dream from his childhood, Dream #3, featuring negative-image back-projection that shows him and his sister enjoying themselves on the back of an apple truck driving through the rain. Early the next morning the three principals set out to cross the river over to the German side in order to carry out clandestine operations, with the focalization returning to Kholin and Galtsev. Ivan is supposed to go off somewhere on another spying mission. Kholin’s mission, which is apparently unauthorized, is more a matter of national pride: he is intent on collecting the corpses of two Russian soldiers which the Germans been placed on the river bank as captured trophies (they need to be given “a proper burial”). After all, isn’t war mainly conducted for the purposes of dignity, revenge, and national honor? Amid heavy shelling, Kholin and Galtsev just manage to make it back to the Russian side of the river; while Ivan is presumed off somewhere on his own spying mission. Later, in a brilliantly choreographed and in-depth shot lasting 3:18, Kholin and Galtsev are back at their station listening to a gramophone and thinking of Ivan when Masha shows up to say good-bye to them. But as with much of life, the vital connection is not made, and she silently and moodily departs from the scene. 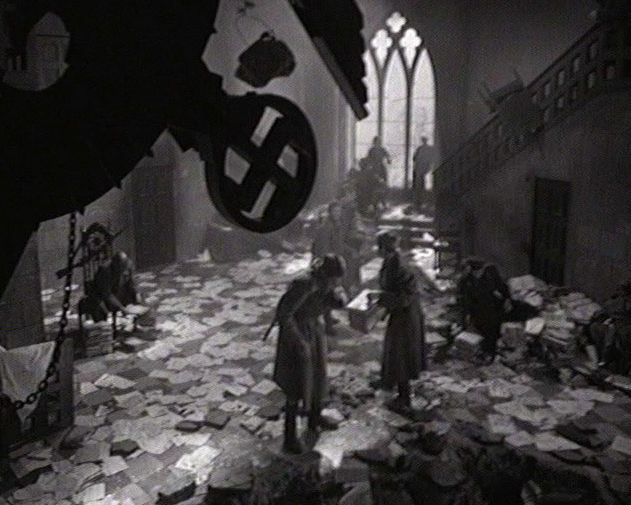 The scene shifts to the celebratory ending of the war, with stock footage showing the suicidal outcomes of Nazi leaders and their families. While sifting through the records of an abandoned Nazi prison, Galtsev is shown reflecting on why he survived the war but Kholin did not. Then he runs across a photographic record showing that Ivan was also captured and executed. The final sequence (Dream #4) shows Ivan in another idyllic setting, running along a beach after his sister, wile his mother lovingly looks on. After he overtakes his sister, he heads towards a dead tree, which constitutes the final image of the film. Ivan vainly looking for a star at the bottom of a well. 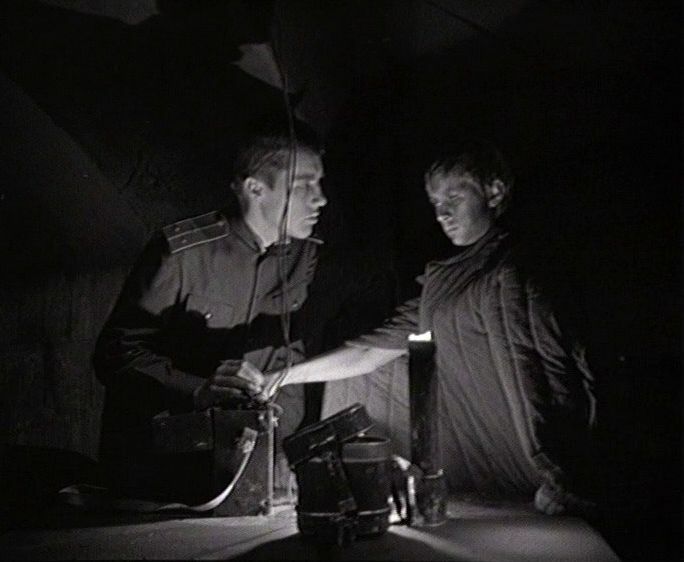 Ivan and Galtsev tried to operate within the confined rules of military procedures. Kholin, however, was willing to step over the lines to pursue his own ends. But Kholin’s ends were still driven by dignity and pride, so none of them was truly free (the way Ivan was in some of the dream sequences). Fergus Daly and Katherine Waugh, “Ivan’s Childhood”, Senses of Cinema (July 2001). Dina Iordanova, “Ivan’s Childhood: Dream Come True”, Film Essays, The Criterion Collection, (22 January 2013). "Ingmar Bergman - On Tarkovsky", Nostalghia.com, Calgary, Canada. Andrey Tarkovsky, Sculpting in Time: Reflections on the Cinema, University of Texas Press Austin (1986, 2000), quoted in Diane Christian and Bruce Jackson (eds. ), “Conversations About Great Films: Andrei Tarkovsky, IVAN’S CHILDHOOD (1962, 84 min)”, Goldenrod Handouts, Buffalo Film Seminars, (XXXI:6), The Center for Studies in American Culture, State University of New York, Buffalo, NY (6 October 2009). Patrick Bureau, “Andrei Tarkovsky: I Am for a Poetic Cinema” (1962), from Andrei Tarkovsky Interviews, John Gianvito (ed. ), University of Mississippi, Jackson, (2006), quoted in Diane Christian and Bruce Jackson (eds. ), “Conversations About Great Films: Andrei Tarkovsky, IVAN’S CHILDHOOD (1962, 84 min)”, Goldenrod Handouts, Buffalo Film Seminars, (XXXI:6), The Center for Studies in American Culture, State University of New York, Buffalo, NY (6 October 2009). “Andrei Rublev”, The Film Sufi, (9/10/2015). Charles H. de Brantes, “Faith is the Only Thing That Can Save Man” (1986), from Andrei Tarkovsky Interviews, John Gianvito (ed. ), University of Mississippi, Jackson, (2006), quoted in Diane Christian and Bruce Jackson (eds. ), “Conversations About Great Films: Andrei Tarkovsky, IVAN’S CHILDHOOD (1962, 84 min)”, Goldenrod Handouts, Buffalo Film Seminars, (XXXI:6), The Center for Studies in American Culture, State University of New York, Buffalo, NY (6 October 2009). Andrey Tarkovsky, Sculpting in Sculpting in Time: Reflections on the Cinema, University of Texas Press Austin (1986, 2000), quoted in Diane Christian and Bruce Jackson (eds. ), op cit.